I love the fabrics you've used. They work so well together. I can't believe you finished this already! Way to go!! Love those fabrics. I am not sure I could work with all those curves! Nice, I like the design. 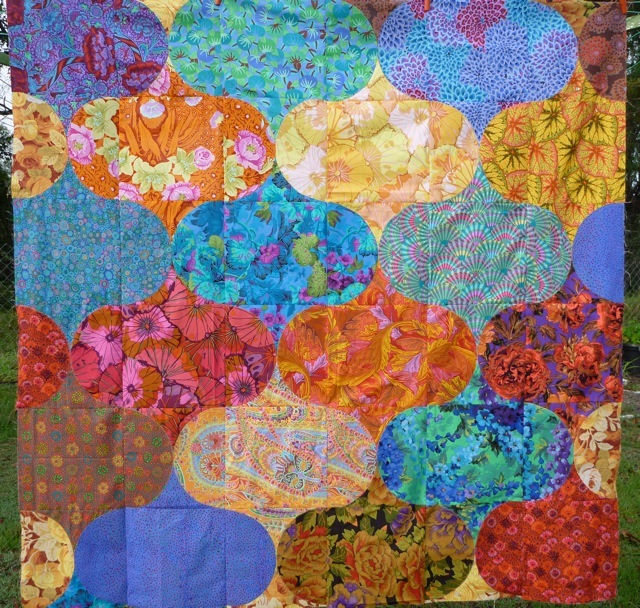 You should check out my site, http://www.TheLoveQuilt.com. I have added a very new, fresh, exciting, and creative twist to quilting. Checking the site out and reading what it is about will be a positive experience for you. =) Keep up the good work! It reminds me of Christmas ornaments – but maybe because I have Christmas on my mind – lol! Beautiful!! Beautiful Quilt!! Love the fabrics..
That is a great pattern and perfect for Kaffe fabric!